Many people associate red lips with winter days and evenings out, but for me I crack out the red lip all year around. I have drawers dedicated to dark lipsticks and even though I will always remain an avid berry lip wearer, the reds have started to make a comeback in my collection. 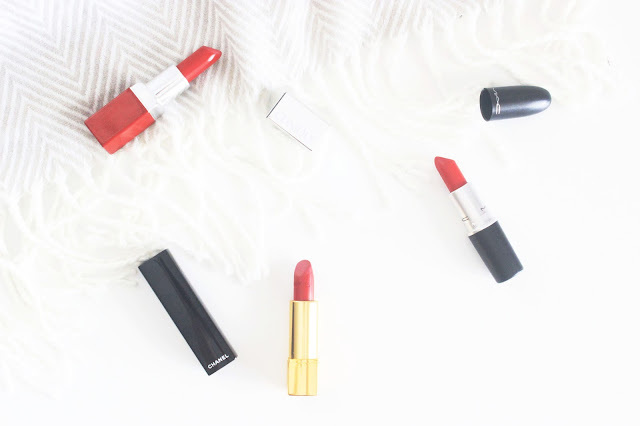 Matte, glossy, orange toned or blue, choosing a red lipstick can be stressful, so today I put together my top three red lipsticks that can be worn for all occasions. MAC Lipstick - Ruby Woo | £15.50 | Link | If you don't own it, want it or know of it then you must have been living under a rock for the past couple of years because Ruby Woo has been talked and raved about since I can remember. When I first got it, my first thoughts were "they weren't joking when they said it was a statement lip", but from first application, I knew it was a keeper. Even though the formula is extremely matte, which means that if you are prone to dry lips it may emphasise flakiness, it really is worth the extra scrub and lip balm as it doesn't budge once applied. The vivid colour makes your lips look fuller, the matte formula makes the shade wearable and the blue-red tone makes your teeth look whiter - Now who wouldn't want all of that? Chanel Rouge Allure Luminous Intense Lip Colour - Pirate | £26 | Link | If you're a regular reader of my blog, then you would have already seen this being featured as my go-to lipstick whenever I am in a rush and even though it is the pricier lipstick out the three, it has quickly become a staple in my collection. The creamy, highly pigmented formula looks great on all skin tones, but the aspect that makes me a little hot under the collar is the glossy finish. With great lasting powder and a wearable finish, it can be worn daily and for all occasions. Clinique Pop Lip Colour + Primer - Passion Pop | £16 | Link | By now you're probably thinking "will she ever shut up about these" and the answer is no. If you're a fan of Ruby Woo, then you need to think of Passion Pop as it's glossier, younger sister. The demi-matte formula leaves the lips feeling nourished and hydrated, but unlike other moisturising lipsticks these don't lack in pigmentation. It's comfortable to wear and suitable for everyday use. Even though it isn't essential, if you want to achieve a fuller looking lip then I would recommend using MAC's Cherry to define your lips and prevent bleeding. What red lipstick is your favourite? I love the look of a red lipstick, but for some reason it never looks right on me. Maybe I just haven't found the right one for my skin tone. I will have to check out the ones you listed above. Great post!